Hoisin sauce is a flavorful Asian sauce that is traditionally made with sesame oil as one of the ingredients. 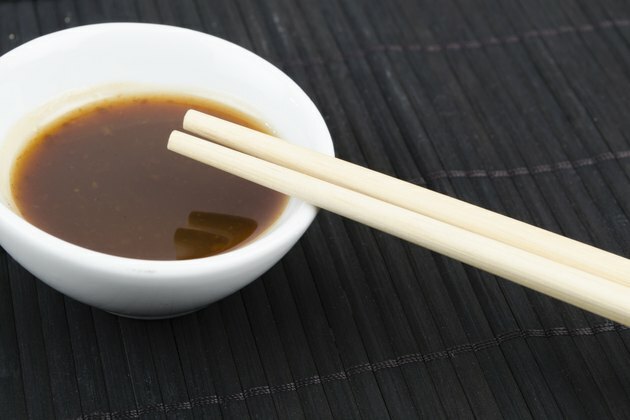 If you lack Hoisin sauce in your pantry but want to achieve a similar flavor, simply start with your sesame oil and add a few ingredients that you most likely already have. In a 2-tbsp. serving, store-bought Hoisin sauce contains 100 calories, 1,060 mg of sodium and 20 g of sugar. It also contains additives including acetic acid, red 40 coloring and preservatives. You can avoid some of the unhealthy aspects of this sauce by making it at home. Pour 2 tsp. of sesame oil into a small bowl as the base of the Hoisin sauce. Mix in with a spoon any of the following ingredients that you have at home: 4 tbsp. soy sauce, 2 tbsp. peanut butter, 1 tbsp. honey or molasses or brown sugar, 2 tsp. white vinegar, 1/8 tsp. each of garlic powder and black pepper, and 20 drops of any type of hot sauce. Find similar ingredients if you are missing any of the above ingredients. If you do not have honey, molasses or brown sugar, use regular white sugar or even maple syrup. If you are missing white vinegar, try a different type that would go with the flavors of the sauce, such as balsamic vinegar. Also, as long as you have most of the ingredients, you can leave a couple out if you do not have them, which will change the flavor slightly but should still create a flavorful sauce. Mix the ingredients with a spoon until they are combined together and form a sauce. Use the Hoisin sauce on dishes like meat, vegetables and rice or noodle mixtures.